Margaret of Scotland (French: Marguerite d'Écosse) (25 December 1424 – 16 August 1445) was a Princess of Scotland and the Dauphine of France. She was the firstborn child of King James I of Scotland and Queen Joan Beaufort. She married the eldest son of the king of France, Louis, Dauphin of France, at eleven years old. Their marriage was unhappy, and she died childless at age 20, apparently of a fever. She was born in Perth, Scotland to James I of Scotland and Joan Beaufort, a cousin of Henry VI of England. Margaret was the first of six daughters and twin sons born to her parents (her surviving brother, James, would become James II of Scotland at six years old). 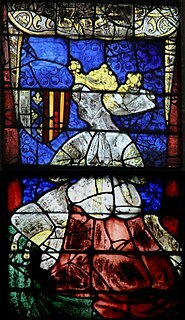 Margaret was Charles VII of France's diplomatic choice for daughter-in-law. The marriage was forced upon Charles's thirteen-year-old son, Louis, which did not help their relationship. However, royal marriages in the 15th century were always political. There are no direct accounts from Louis or Margaret of their first impressions of each other, and it is mere speculation to say whether or not they actually had negative feelings for each other. Several historians think that Louis had a predetermined attitude to hate his wife because she was his father’s choice of bride. But it is universally agreed that Louis entered the ceremony and the marriage itself dutifully, as evidenced by his formal embrace of Margaret upon their first meeting on 24 June 1436, the day before their wedding. Margaret and Louis' marriage shows both the nature of medieval royal diplomacy and the precarious position of the French monarchy. The marriage took place 25 June 1436 in the afternoon in the chapel of the castle of Tours and was presided by the Archbishop of Reims. By the standards of the time, it was a very plain wedding. Louis, thirteen, looked clearly more mature than his bride, eleven. Margaret looked like a beautiful “doll,” perhaps because she was treated as such by her in-laws. Charles wore “grey riding pants” and “did not even bother to remove his spurs.” The Scottish guests were quickly hustled out after the wedding reception. This was seen as something of a scandal by the Scots. King Charles’ attire and the speed with which the guests were hustled out was considered an insult to Scotland, which was an important ally in France's war with the English. However, this spoke to the impoverished nature of the French court at this time. They simply could not afford an extravagant ceremony or to host their Scottish guests for any longer than they did. Following the ceremony, “doctors advised against consummation” because of the relative immaturity of the bride and bridegroom. Margaret continued her studies and Louis went on tour with Charles to loyal areas of the kingdom. Even at this time, Charles was taken aback by the intelligence and temper of his son. During this tour, Louis was named Dauphin by Charles, as is traditional for the eldest son of the king. Margaret was considered lovely, gracious and very beautiful, with a certain ability to write poetry and rhymes, though no example of her compositions survived destruction at her husband's hands after her death. She was also very interested in the French court's social and gallant life. She was a favourite of her father-in-law Charles VII of France and popular among the courtiers. However, she felt herself alien amongst the French court and became depressed. She had a strained relationship with her husband, the future king of France, mainly because of Louis' hatred of his father. Charles VII ordered the marriage, and Margaret frequently supported the king against her husband. It is said that she wore a strongly-tied corset because of her fear of pregnancies, ate green apples and drank apple vinegar. Her unhappy marriage furthered her depression, as did the gossip regarding her by supporters of Louis. On 16 August 1445, between ten and eleven at night, she died in Châlons-sur-Marne, Marne, France at the age of 20. On Saturday, 7 August, she and her ladies had joined the court on a short pilgrimage. It was very hot, and when she returned, she undressed in her stone chamber. The next morning she was feverish, the doctor diagnosed the inflammation of the lungs. She died, raving against a Jamet de Tillay, a Breton soldier, in favour of her father-in-law, King Charles (Jamet surprised Margaret at her habitual poetry reading, when there were no candles, only a good fire in the mantelpiece; he stuck a candle into her face, sniggered and afterwards went around, talking about "wanton princesses". Louis was cold to Margaret, and she attributed his coldness to the gossip spread by Jamet. She died, protesting her faithfulness to her husband, and accused Jamet of killing her with his words). 1 Melancholic and distressed by slander against her, she sank into a final languor before dying. Her last words, in response to others' urgings to rouse herself and live, were supposedly Fi de la vie! qu'on ne m'en parle plus ("Fie on life! Speak no more of it to me"). She was buried in the Saint-Laon church in Thouars, in the Deux-Sèvres department of France. Five and a half years after her death, her husband married Charlotte of Savoy, by whom he had three surviving children: Charles VIII of France, and two daughters, Anne of France and Jeanne. Margaret is also famous for the legend that she was kissed or almost kissed by poet Alain Chartier while asleep in her own rooms (another variant of this legend has Anne of Brittany as its protagonist), though her age and location at the time of Chartier's death would have made that impossible. ^ Paul Murray Kendall, Louis XI:The Universal Spider, (New York: W. W. Norton & Company Inc., 1971), 43. Lord Gray is a title in the Peerage of Scotland. The Barony of Gray was created circa July 1445 for the Scottish diplomat and politician Sir Andrew Gray. The first Lord Gray was a hostage in England for the good conduct of James I of Scotland from 1424 to 1427, and was one of the knights who accompanied Lady Margaret Stewart to France for her marriage to Louis XI of France in 1436. He was also a Commissioner to England between 1449 and 1451, Master of the Household to James II of Scotland in 1452, and a Warden of the Marches in 1459. In June 1489 King James IV granted to Andrew, Lord Gray, the lands and Barony of Lundie [RGS.II.1860]. Isabeau of Bavaria was born into the House of Wittelsbach as the eldest daughter of Duke Stephen III of Bavaria-Ingolstadt and Taddea Visconti of Milan. She became Queen of France when she married King Charles VI in 1385. At age 15 or 16, Isabeau was sent to France on approval to the young French king; the couple wed three days after their first meeting. Yolande of Aragon was a throne claimant and titular queen regnant of Aragon, titular queen consort of Naples, Duchess of Anjou, Countess of Provence, and regent of Provence during the minority of her son. She was a daughter of John I of Aragon and his wife Yolande of Bar . Yolande played a crucial role in the struggles between France and England, influencing events such as the financing of Joan of Arc's army in 1429 that helped tip the balance in favour of the French. She was also known as Yolanda de Aragón and Violant d'Aragó. Tradition holds that she commissioned the famous Rohan Hours. Elisabeth of France was Queen consort of Spain and Portugal as the first spouse of King Philip IV of Spain. She served as regent of Spain during the Catalan Revolt in 1640-42 and 1643-44. She was the eldest daughter of King Henry IV of France and his second spouse Marie de' Medici. Maria Josepha of Saxony was a Dauphine of France from the age of fifteen through her marriage to Louis de France, the son and heir of Louis XV. Marie Josèphe was the mother of three kings of France, including Louis XVI, as well as Madame Élisabeth. Marie Joséphine of Savoy was a Princess of France and Countess of Provence by marriage to the future King Louis XVIII of France. She was, in the opinion of Bourbon Royalists Legitimists, regarded as titular 'Queen of France' when her husband assumed the title of King in 1795 upon the death of his nephew, the titular King Louis XVII of France, until her death. In reality she never had this title, as she died before her husband actually became King in 1814. 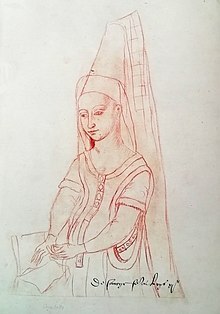 Margaret of Nevers, also known as Margaret of Burgundy, was Dauphine of France and Duchess of Guyenne as the daughter-in-law of King Charles VI of France. A pawn in the dynastic struggles between her family and in-laws during the Hundred Years' War, Margaret was twice envisaged to become Queen of France. Isabella Stewart, was a Scottish princess and Duchess of Brittany by marriage to Francis I, Duke of Brittany. Also known as Isabel Stewart and Isabel of Scotland, she was the second daughter of James I of Scotland and Joan Beaufort and the second wife of Duke Francis I of Brittany. Eleanor of Scotland was an Archduchess of Austria by marriage to Sigismund, Archduke of Austria, a noted translator, and regent of Austria in 1455-58 and 1467. She was a daughter of James I of Scotland and Joan Beaufort. Margaret, Countess of Vertus, was a French vassal, Countess of Vertus and Etampes 1420–1466. She was the daughter of Louis I, Duke of Orléans, and Valentina Visconti.